v. : ; 28 cm. For sale by the Bureau of the Census, Washington, D.C., 20233, and U.S. Department of Commerce Field Offices. Price: Annual subscription $1.00, single issue ten cents. ments into the United States from Puerto Rico and from U.S.
houses for release into domestic consumption channels. importers are required to file with Collectors of Customs. (i.e., the date of the inward Customs manifest for the vessel). 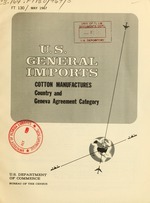 rangements Regarding International Trade in Cotton Textiles,"
Tariff Schedules of the United States Annotated (TSUSA). than the weight of the cotton component of the commodity only. able free upon request to the Bureau of the Census. be made to the Bureau of the Census. NANSEI AND NANPO ISLANDSt N.E.C.